The Transamerica Pyramid is a skyscraper in San Francisco shaped roughly like a pyramid that Luigi is able to visit it in Mario is Missing! Despite what the DOS image depicts, it is not slanted at a 45° angle in reality. 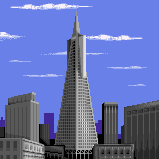 Here, he has to return the Top of the Transamerica Pyramid to the landmark, as it has been stolen by Koopa Troopas invading the city, causing the Pyramid to be closed to the public. Finding and stomping the Koopa Troopa in possession of the artifact allows Luigi to return it to the Pyramid, thereby opening it, though he first has to answer some questions about the Transamerica Pyramid first, listed below. The Transamerica Pyramid on Columbus Avenue in downtown San Francisco was built in 1972. It has become a landmark due to its unusual shape. Standing 853 feet tall, the Pyramid is said to have changed the distinct shape of the city's skyline. San Francisco is very susceptible to earthquakes, so the Pyramid was built with a flexible concrete base which makes it one of the most earthquake-proof of all of San Francisco's skyscrapers. This page was last edited on March 29, 2018, at 18:23.